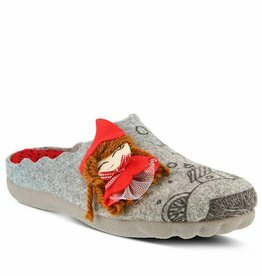 Easy to slip-on indoor/outdoor wool slipper featuring a whimsical (and friendly!) "Red Riding Hood" and "Big Bad Wolf" duo. Side fringe details shake alongside yarn mini poms on this slipper-sock hybrid. A faux suede bottom lets you pad around the house in the cozy pair.